As an industrial society, our working needs and wants are satisfied by an ever-changing landscape of machinery and equipment. Every industry experiences improved technology and equipment design to make our lives easier. Lawn care is no exception. Such advances have been made in lawn and field rotary cutters that perhaps it’s time to look at the advantages of a flail mower over a rotary cutter. Do you think you want to be a paving contractor? If you enjoy being outdoors, are not bothered by traffic whizzing by you and are not intimidated by using equipment that can be two stories tall, then perhaps you will be one of the latest to enter the field of paving contractors. Hardscaping is a word used to describe the process of adding hard features to a landscaped area, such as walls, stairs and paths. 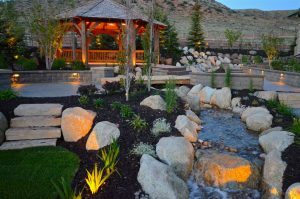 Although there are many materials to choose from when it comes to creating a hardscape, concrete provides several benefits. Here are a few of the advantages to hardscaping with concrete for you to consider for your next project. Excavating contractors perform several jobs that play a necessary and essential role in a wide variety of construction projects from small to large. The benefits of hiring a contractor for your excavating needs are numerous, and can often help you save money and time. Here are a few reasons why you should hire an excavating contractor for your next construction project. Concrete is a versatile building material that lends itself to a wide variety of uses for both homes and businesses. A concrete driveway is a primary example of how this material is effective and advantageous for homeowners on a daily basis. If you’re about to install a new driveway, here are a few reasons why you should consider concrete for the job. So, you’ve decided to get some stone or brick work done to your home. Perhaps you wanted a new accent to your fireplace or maybe you’re looking to renovate your patio. Whatever the reason is, you need a masonry contractor. If you’ve never worked with a contractor before, you may not know what to look for. It can seem pretty daunting. Here are three tips to hiring the right contractor. One of the first things that you should do is to check references and reviews. While you’re researching the right contracting company to hire, check out what other people are saying about them. This will help you get an idea of what kind of work they do and how satisfied their clients are. Stone is one of the most versatile materials that can be used in home remodeling. Stone masonry can be used on the exterior of your home or indoors. If you’ve ever gone shopping for stone, you probably noticed the wide array of options that you have. Stone can be used for essentially any project. It’s a timeless material that offers curb appeal to any home. If you’re thinking about stonework, here are a few tips to make your renovation go smoothly. Concrete is widely used in construction work of all types, especially home renovating. It’s considered one of the most durable and resistant materials on the market. When it comes to working with concrete there are dangers and hazards involved. However, all of these hazards can be avoided with the proper concrete masonry safety training. For every hazard, there is also a solution. When it comes to home renovating, concrete is a material that is brought up regularly. For some people, concrete may not seem like the first option. To many, it may seem too plain or less decorative. This isn’t the case, however. In fact, concrete masonry can be used to revitalize an entire area. It’s decorative and functional and can change the entire look of your patio, basement or driveway. The growing popularity of concrete isn’t simply due to its price or its function, but also how it can look.